Accredited Scale Inspection Alberta | Accurate/Western Scale Co. Ltd.
Accurate/Western Scale Co. Ltd. was incorporated in January, 1992, and currently occupies a 1500 sq. ft. facility. This includes one service bay as well as sales and administration offices. Accurate/Western Scale Co. Ltd. is co-owned by Western Scale of Port Coquitlam, BC, one of the largest scale manufacturers in Canada. Accurate/Western Scale Co. Ltd. is a distributor for various scale manufacturers and offers a wide variety of state of the art weighing equipment and other related products. The combined years of sale and service experience enable our technicians to provide efficient service, calibration and installation of scale equipment to our growing number of customers. Our vehicle fleet includes two tandem test trucks, complete with 10,000 kg of certified test weights, and three ¾ ton service vehicles. The test weights used for calibrations are all traceable standards and are certified by Measurement Canada, ranging from those used on truck scales down to laboratory balances, or from 500 kg to 1 gram. Accurate/Western Scale Co. Ltd. is Measurement Canada Accredited, which enables us to be authorized scale inspectors, as well as able to perform inspections and certify specified legal for trade devices on behalf of Measurement Canada under the Weights & Measures Act. We also maintain an internal quality system in accordance to Weights and Measures regulations. Accurate/Western Scales Co. Ltd. maintains a Quality Management System, based on Measurement Canada’s SA-01 Accreditation Standard, and our system is audited on an annual basis by Measurement Canada. 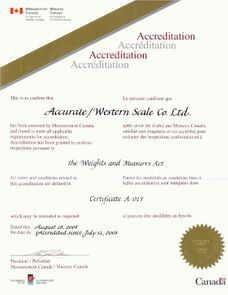 Accurate/Western Scale Co. Ltd. currently employs 4 service personnel who have received recognition from Measurement Canada to certify scales. Wade Sidor has 20 years of experience and has been accredited since May, 2003. Dan Gregory has 11 years of experience and has been accredited since April, 2004. Tim Easton has 7 years of experience and has been accredited since December, 2008. Ben Hatfield has 1 ½ years experience, has been accredited since June 2013. If you’d like to know more about our company or the quality of service we provide, or if you’d like to get a quote, contact us today.